Acer recently announced its new TravelMate X3 commercial notebook series designed for small and medium businesses, and professionals who want to work in style. First in the series, the 14-inch TravelMate X349, boasts a modern, brushed metal design that blends style with advanced technology. It is designed for those who require a workhorse notebook that is stylish and delivers best-in-class performance, portability, and security. 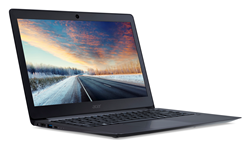 Enclosed in a sleek all-aluminum chassis with a brushed-metal finish, Acer’s TravelMate X349 is built to be highly portable, weighing just 1.53 kg (3.3 pounds), and measuring under 18 mm (0.7 inches) thin. It features 6th Generation Intel® Core™ processors, up to 8GB DDR4 memory, and up to 512GB SSDs, for not only outstanding performance but also an impressive battery life of up to 10 hours1 to support productivity on the go, away from the office. The TravelMate X349 ships with Windows 10 Pro, providing powerful security and productivity essentials for business needs. The TravelMate X349’s 14-inch display supports Full HD resolution (1920 x 1080) with IPS technology2 that offers crystal clear viewing of documents and webpages with wide viewing angles. In addition, the display reclines 180 degrees to lie fully flat for flexible use-cases such as sharing content in small group discussions. The TravelMate X349 also boasts an LED backlit keyboard to keep users productive in low-light situations on airplanes and commuter trains. A chiclet-style keyboard provides excellent tactile feedback for accurate touch-typing, and its wide Precision Touchpad promotes comfortable and responsive navigation. For users who regularly contact offsite vendors and partners, the TravelMate X349 has fine-tuned speakers and microphones for crisp and lag-free communication, together with a 720p HDR webcam for high-quality videoconferencing. For quick plug-and-play docking, the TravelMate X349 also includes a USB Type-C port for pairing with an Acer USB Type-C Dock (sold separately) to connect up to two 4K displays, whilst providing power and a variety of peripheral connections through a single cable. In addition to its premium design, the TravelMate X349 was built to exceed expectations when it comes to software and security. An integrated touch fingerprint sensor supports Windows Hello for fast and secure sign-in, unlocking the device at a touch. It also ships a Trusted Platform Module (TPM) 2.0 chip that increases platform integrity and provides hardware-based protection for passwords and encryption keys. The TravelMate X349 is preloaded with Acer ProShield Manager, a suite of security and management tools to safeguard sensitive data, and Acer Office Manager, allowing IT professionals to quickly deploy security policies and monitor assets from one simple-to-use interface. Rashi Peripherals, National Distributor for Plantronics in India introduces the much awaited Voyager 5200 to India market. The next generation Bluetooth headset, Voyager 5200 offers an array of features which boasts of a state-of-the-art wind & noise cancelling technology. With the Aerodynamic boom resisting turbulence and Windscreen filtering the initial air layer, crisp clear sound is obtained with Wind Box enclosed microphones powered by Multi Mic Array and Wind Avoidance Algorithm which cancel up to 26 decibels of noise. Another marvelous feature is the in-case charging facility along with a magnetic stand. Voyager 5200 is very user friendly option with their easy access, multi functioning button offering direct Siri connect. Packed with sleek attributes like 4 active DSP mic, 6 layers of transmit DSP, HD Voice, Bluetooth 4.1, caller name announce, voice answer/ignore, smart sensors, A2DP (media streaming, GPS, etc), multipoint technology, 14 voice prompt languages, NFC pairing, adaptive volume, P2i Nano-coating moisture protection, micro USB and magnetic charging options, 7 hours of talk time, battery meter-the Voyager 5200 promises to be an enviable possession. On this occasion Rajesh Goenka, Vice President for Sales and Marketing at Rashi Peripherals added; “We are thrilled to be the distributors of the new Plantronics Voyager 5200 in the country. We hope that this Bluetooth takes customer experience to the next level. ESS Distribution has announced appointment of Mr. Rajiv Warrier as Country Head. He was previously working as National Sales Manager – Enterprise after joining the company earlier this year. As Country Head Mr. Warrier will be responsible for leading overall operations of ESS Distribution offices and representatives across India, strengthening its presence in such segments as security, encryption and back-up software and business intelligence solutions. ESS Distribution is actively promoting ESET products and other software brands in India through a vast network of channel partners. Having over 25 years of experience in the IT industry and distribution business, Mr. Rajiv Warrier holds a Computer Engineering degree from Pune University, MBA in Marketing and Diploma in Import Export Management. Before joining ESS Distribution, he worked in a dual role as a Brand Manager and Product Manager with Creative Peripherals Private limited. He was also associated with Aladdin Multimedia Pvt. Ltd., a company distributing software, multimedia products and gaming peripherals to large format resellers. In his new role, Mr. Warrier will not only work on improving operations but will also be responsible for maintaining and perfecting processes and channel policies to support sales and support activities. Long-term marketing strategies will also be part of Mr. Warrier’s responsibilities. “I look forward to leading ESS team and business towards the new heights, to share my experience with team members in order to help them perform at their best. Apart from them I am planning to work on identifying new business opportunities and new brands that can be added to enhance the current ESS business,” Rajiv Warrier, Country Head at ESS Distribution Pvt. Ltd. said. He added that his long-term plans include investing time and energy in supporting the channel in India and generating more business opportunities for channel partners and hence grow along with them. “Since I myself was a channel partner I can well relate to channel needs and requirements, hence my actions and strategies will definitely revolve around it”, he noted. Commenting on the new appointment, Eugenia Zabashtan, Business Development Director, ESS Distribution, said: “Rajiv is a great manager, unmatched leader and ideas-generator having a very strong personality. We are extremely happy to have him on board as the company is currently in the active growth phase and we are looking at intensifying this growth further“. Dell announced performance and capability updates to its PowerEdge 13th generation four-socket server portfolio, engineered for enterprise customers with large scale server deployments to solutions requirements for remote and branch offices. Designed to optimize performance for big data and real-time analytics and dense virtualization deployments the updated PowerEdge servers enable the flexibility, scalability and manageability of customers’ demand for the future-ready enterprise. NEC Corporation and NEC Technologies India Private Limited (NTI) announced the establishment of the ‘OSS Technology Centre,’ an organization specializing in technical support related to the use of open source software (OSS). The new organization begins operations on July 1 with approximately 50 staff based out of NTI, consisting of experienced OSS engineers who are well-versed in OSS solution architecture, as well as essential software development and support capabilities. The OSS Technology Centre aims to strengthen the organizational structure for supporting global enterprises in building systems based on OSS, to reinforce collaboration with international OSS vendors and to provide rapid technical support to users who construct systems operated globally using OSS.Moreover, the new organization will actively carry out development of new network functions related to Software-Defined Networking (SDN), Network Functions Virtualization (NFV) and application platform functions, such as container and Platform as a Service (PaaS), all of which is part of the OSS Technology Centre’s OpenStack-based development activities, in addition to its contributions to making source codes openly available by providing them to the OSS community. Cisco announced LaunchPad, an open innovation initiative to accelerate startups and support growth in India’s developer community. Cisco LaunchPad is designed to help startups, its authorised channel partners and developers scale their solutions, address new markets and build digital businesses. Cisco’s finest teams will mentor startups and developers on how to help create digital solutions to enable enterprise customers, service providers and other enablers in the public and private sphere to connect the next three billion people and 50 billion devices through digitisation, matching appealing ideas with business expertise and connecting engineering talent with investors and customers. Cisco will also provide a space at its Bengaluru campus with access to a suite of Cisco technologies and free grants to startups chosen to work at its campus. Home to more technology startups than any other Indian city, Bengaluru offers a powerful combination of talent and infrastructure as well as business, academic, and research expertise. India is the youngest startup and developer nation in the world with 72% of startup founders less than 35 years old and the average developer less than 29 years old. India is projected to have the world’s largest number of developers by 2018. UIMI launches its UIMI U3 6000mAh power Bank. Power bank like other UIMI Power Bank units sports a Plastic and rubber body along with temperature, input overload, short circuit, and output over current, and reset protection.U-3 Portable Solar charging Power bank with photo voltaic panel which retains charging of internal battery from Sun light and even by the wall outlet you can charge. Smartphone, tablet, smart watch and iPhones are connected with your devices when their battery dies always when you are in need of it. They have an adequate amount of charging capacity of 6000mAh.You can charge simultaneously two devices at the same time by two USB charging ports. With photo voltaic panel which retains charging of internal battery from sun light and even by the wall outlet you can charge. Smartphone, tablet, smart watch and iPhones and connected with your devices when their battery dies always when you are in need of it. They have an adequate amount of charging capacity of 6000mah. You can charge simultaneously two devices at the same time by two USB charging ports. U3 is one of the series of UIMI INDIA power bank, manufactured to accomplish with the changing needs of your smart phones and tablets as well as to reduce your electricity consumption as providing the facility to charge by direct sun light. U3 is fabricated by lithium polymer battery providing better charging capacity with 6000mah that can charge your smart phone at least 3-4 times. It has high tendency for heat resistance and temperature control. Thermaltake, an industry leader in computer chassis, thermal solutions, and power supply units, had recently announced the latest TT Premium product line which follows the core values of Excellent Quality, Unique Design, Diverse Combinations and Boundless Creativity. Under this product line, Thermaltake India now presents, the new Core W Series – Core W100 super tower chassis to deliver versatility in different superior looks. Being the first chassis with full assembly concept, the Core W Series is the great new challenge for makers to start from zero and experience the true “DIY” by putting every piece together to complete a high-end system. And the Core W100 is the one and only chassis able to house more than 20 HDD cages and up to 10 expansion slots, which can be served as another workstation in the industrial field. With its unprecedented space for high-end hardware and liquid cooling expansion, the Core W100 supports the latest XL-ATX, E-ATX, ATX, Micro ATX, Mini-ITX motherboards, and also SSI MEB. All standard equipment of the chassis is included, what makers need to purchase is custom liquid cooling components one needs for building up aesthetically-superior water cooling systems by incorporating externally-modular upgrades for their chassis.